The new iPhone XR, XS, and XS Max have everyone buzzing. But, at first glance, the XR and XS look pretty similar in almost every way. So, what's the difference? It comes down to the XR's "Liquid Retina" LCD screen vs. the XS's "Super Retina" OLED display. How do they compare, and why does it matter when considering which new iPhone to preorder? This discussion is nothing new — the now-discontinued iPhone X was the first from Apple to sport an OLED display, while the iPhone 8 and 8 Plus shipped with the standard LCD we had grown accustomed to. All the points made below can be applied to those iPhones as well, save for the lack of Touch ID. OLED technology has found its way into consumer tech products more and more in recent years. If you were to walk into Best Buy right now, there's a good chance any given smartphone or TV you pick up would have an OLED display. But what is it, and is it better than LCD? To keep it simple, if your display is OLED, each pixel in the screen emits its own light. That means black portions of the screen don't need to be turned on at all, both saving power as well as achieving contrast other displays simply can't. LCD, on the other hand, requires an overall backlight, so even if you fill the screen with a solid black square, you'll still see light coming from the phone. Nexus 6P with AMOLED screen (left), iPhone 6 with LCD screen (right). 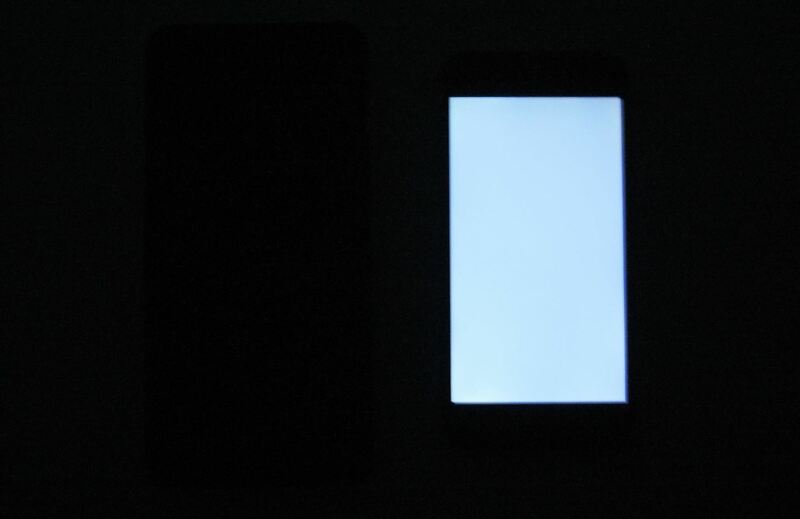 Both devices displaying an OLED test image at full brightness in a dark room. This difference is why you can't hide the notch on the XR with wallpapers like you can with the XS — these wallpapers run a strip of black across the top of the iPhone. That strip won't appear in OLED displays, effectively hiding the notch. However, XR's LCD display will still have some light bleed shining through blacks, doing nothing to obscure its notch. The big flaw of OLED displays, however, is their susceptibility to burn-in, or after-image, when images that were once on-screen are now visible whenever using the device. This commonly occurs with menus and other items that remain on-screen for lengthy periods of time, but so far, this hasn't been a common issue for iPhones to have. These are the biggest differences between the two displays in general. But Apple has designed bigger differences specifically between the XR and the XS and XS Max. Let's talk resolution. The XS has a resolution of 2436 x 1125, while the XS Max has a resolution of 2688 x 1242. These two displays have the same pixel density of 458 PPI, however, so effectively, these displays are equally sharp. The LCD on the XR, on the other hand, has a resolution of 1792 x 898 with a pixel density of 326 PPI, even though its display is four-tenths of an inch larger than the XS. If you were to hold these displays up against each other, you would be able to see that the XS or XS Max have sharper displays than the XR, OLED aside. In addition, the XS and XS Max have HDR — or high-dynamic-range — displays. HDR displays can take advantage of HDR content, which deliver deeper, more vibrant colors to your movies, TV shows, and even YouTube videos. The XR does not have an HDR display, so you'll be missing out on that extra perk. We can't compare brightness or color temperature between the displays yet, however, since Apple does not release that information to the public. This isn't normally an issue, except third parties can't test the displays since the iPhones have not yet released. At this time, go by this — if you're looking for the sharpest, most vibrant display possible for your new iPhone, you'll want to go for an XS. So, Is the XS Better? Make sure to check out our comparison below in addition to this article to get a complete picture of the XR vs. the XS and XS Max.